OREP is partnering with McKissock to offer Approved USPAP Training and other Education at a discount. McKissock is the official provider of the Appraisal Foundation’s online 2018-2019 USPAP courses. Members: The discount price of $179.99 (7 hrs.) applies to OREP Insureds, Affiliate Members and Working RE Paid Subscribers. 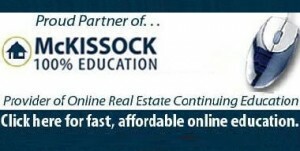 McKissock is the official provider of the Appraisal Foundation’s online 2018-2019 USPAP courses. Request your discount link. Purchase a “Bundled Package” of Approved Continuing Education and save! Special Packages of coursework with up to 49 hours of approved continuing education are available at a significant discount (over purchasing separately). Classes are for appraisers, inspectors and real estate professionals. Click to shop. Learn a step-by-step, bulletproof methodology for conducting FHA or conventional residential appraisal site inspections. Course includes extensive videos and proprietary forms that will make your FHA appraisals more effective and efficient. Click here to learn more.